Labs are vying to build ever-bigger colliders against a backdrop of uncertainty about how particle physicists will make the next big discoveries. 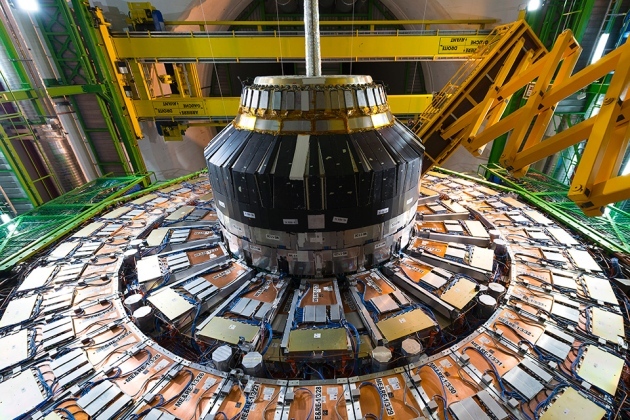 It was a triumph for particle physics — and many were keen for a piece of the action. The discovery of the Higgs boson in 2012 using the world’s largest particle accelerator, the Large Hadron Collider (LHC), prompted a pitch from Japanese scientists to host its successor. The machine would build on the LHC’s success by measuring the properties of the Higgs boson and other known, or soon-to-be-discovered, particles in exquisite detail. But the next steps for particle physics now seem less certain, as discussions at the International Conference on High Energy Physics (ICHEP) in Chicago on 8 August suggest. Much hinges on whether the LHC unearths phenomena that fall outside the standard model of particle physics — something that it has not yet done but on which physicists are still counting — and whether China’s plans to build an LHC successor move forward. When Japanese scientists proposed hosting the International Linear Collider (ILC), a group of international scientists had already drafted its design. The ILC would collide electrons and positrons along a 31-kilometre-long track, in contrast to the 27-kilometre-long LHC, which collides protons in a circular track that is based at Europe’s particle-physics laboratory, CERN (See ‘World of colliders’). Because protons are composite particles made of quarks, collisions create a mess of debris. The ILC’s particles, by contrast, are fundamental and so provide the cleaner collisions more suited to precision measurements, which could reveal deviations from expected behaviour that point to physics beyond the standard model. For physicists, the opportunity to carry out detailed study of the Higgs boson and the heaviest, ‘top’ quark, the second most recently discovered particle, is reason enough to build the facility. Japan’s Ministry of Education, Culture, Sports, Science and Technology (MEXT) was expected to make a call on whether to host the project — which could begin experiments around 2030 — in 2016. But the Japanese panel advising MEXT indicated last year that opportunities to study the Higgs boson and the top quark would not on their own justify building the ILC, and that it would wait until the end of the LHC’s first maximum-energy run – scheduled for 2018 – before making a decision. That means the panel is not yet convinced by the argument that the ILC should be built irrespective of what the LHC finds, says Masanori Yamauchi, director-general of Japan’s High Energy Accelerator Research Organization (KEK) in Tsukuba who sat on an ICHEP panel at a session on future facilities. “That’s the statement hidden under their statement,” he says. If the LHC discovers new phenomena, these would be further fodder for ILC study — and would strengthen the case for building the high precision machine. US physicists have long backed building a linear collider. And a joint MEXT and US Department of Energy group is discussing ways to reduce the ILC’s costs, says Yamauchi, which are now estimated at US$10 billion. A reduction of around 15% is feasible — but Japan will need funding commitments from other countries before it formally agrees to host, he added. Snapping at Japan’s heels is a Chinese team. In the months after the Higgs discovery, a team of physicists led by Wang Yifang, director of the Institute of High Energy Physics in Beijing, floated a plan to host a collider in the 2030s, also partially funded by the international community and focused on precision measurements of the Higgs and other particles. Circular rather than linear, this 50–100-kilometre-long electron–positron smasher would not reach the energies of the ILC. But it would require the creation of a tunnel that could allow a proton–proton collider — similar to the LHC, but much bigger — to be built at a hugely reduced cost. Wang and his team this year secured around 35 million yuan (US$5 million) in funding from China’s Ministry of Science and Technology to continue research and development for the project, Wang told the ICHEP session. Last month, China’s National Development and Reform Commission turned down a further request from the team for 800 million yuan, but other funding routes remain open, Wang said, and the team now plans to focus on raising international interest in the project. By affirming worldwide interest in Higgs physics, the Chinese proposal bolsters Japan’s case for building the ILC, says Yamauchi. But if it goes ahead, it could drain international funding from the ILC and put its future on shakier ground. “It may have a negative impact,” he says. In the future, the option to use China’s electron–positron collider as the basis for a giant proton–proton collider could interfere with CERN’s own plans for a 100-kilometre-circumference circular machine that would smash protons together at more than 7 times the energy of the LHC. Until the mid-2030s, CERN will be busy with an upgrade that will raise the intensity — but not the energy — of the LHC’s proton beam. And by that time, China might have a suitable tunnel that could make it harder to get backing for this ‘super-LHC’. At ICHEP, Fabiola Gianotti, CERN’s director-general, floated an interim idea: souping up the energy of the LHC beyond its current design by installing a new generation of superconducting magnets by around 2035. This would provide a relatively modest boost in energy — from 14 teraelectronvolts (TeV) to 20 TeV — that would have a strong science case if the LHC finds new physics at 14 TeV, said Gianotti. Its $5-billion price tag could be paid for out of CERN’s regular budget. For decades, successive facilities have found particles predicted by the standard model, and neither the LHC nor any of its proposed successors is guaranteed to find new physics. Questions asked at the ICHEP session revealed some soul-searching among attendees, including a plea to reassure young high-energy physicists about the future of the field and contemplation of whether money would be better spent on other approaches rather than ever-bigger accelerators. Indeed, the US is betting on neutrinos, fundamental particles that could reveal physics beyond the standard model, not colliders. The Fermi National Accelerator Laboratory (Fermilab) in Batavia, Illinois, hopes to become the world capital of neutrino physics by hosting the $1-billion Long-Baseline Neutrino Facility, which will beam neutrinos to a range of detectors starting in 2026.